Shark vs Dyson - Which is Best? Shark vs Dyson – Which Vacuum Cleaner is Best? If you want to know the REAL difference between Shark vacuums and Dyson vacuums ask someone who actually has the vacuums. I have personally tested many machines from each company, and as the photo above shows I have a few. In this article we analyze some of the top vacuums from both companies, compare specifications and provide pros & cons. SharkNinja Operating LLC is a US based company with two main product lines – “Shark” which sells vacuums and steam-mops, and “Ninja” which is focused on small kitchen appliances. You will often see the vacuums and steam-mops under the name “Shark” or “SharkNinja”. The company has been growing rapidly and, according to Inc Magazine, it is now one of the top 5000 fastest growing companies in the USA. Their aggressive telemarketing has provided them a respectable share of the US market. They also have offices in the UK, Canada and China (where the vacuums are manufactured). Shark seems to have a somewhat contentious relationship with Dyson, and the two companies have recently been embroiled in legal battles over advertising claims. Dyson Ltd is a British technology company and is larger than Shark. Dyson manufactures a range of products including hand dryers, fans, and motors but is probably most famous for its somewhat high-end vacuum cleaners. Dyson is arguably one of the best-known vacuum cleaner brands in the world. Dyson products are marketed worldwide but the vacuum cleaners are made in Malaysia and Singapore. The company has approximately 7000 employees worldwide with the bulk of those being in Asia. In January 2018 Dyson launched a legal case in the UK against Shark contending that Shark is publishing misleading advertising claims regarding which vacuums generate the most suction. This seems to be about the Dyson V8 and the Shark IONFlex – two vacuums that we discuss in this article. Both companies manufacture bagless vacuums only. The vacuums have a dust canister that collects the dust/debris. The canister can be detached from the vacuum, emptied, then reattached. There is no need to buy and dispose of bags. 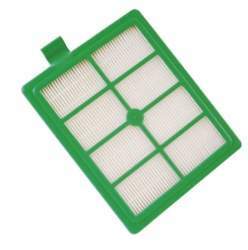 Both companies generally provide washable filters. Usually both pre-motor filters and post motor filters can be rinsed in water and left to dry, then reinserted back into the vacuum. The washable filters combined with the bagless technology reduce the need for consumables. Most Dyson vacuums offer HEPA level filtration while only some Shark machines provide it. If you want HEPA filtration make sure you check the specs for the particular vacuum model. A sealed system means that the air/dust/debris pulled into the vacuum does not escape though poor seals or cracks. It is forced through the filtration system prior to being exhausted from the machine. This ensures that only filtered air is reintroduced back into the environment. This is probably a more prominent feature in Dyson vacuums and they often highlight this by letting you know that the vacuum is certified by the Asthma and Allergy Foundation of America. Sometimes you will also see Dyson use the terminology “Whole-machine HEPA filtration” or “Certified asthma & allergy friendly”. Some Shark machines have a sealed system but not all. 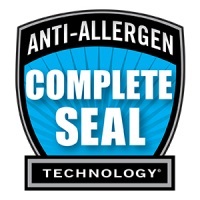 Shark calls this “Anti-Allergen Complete Seal Technology” and if their machine has it they will tell you. Shark even has a video showing how important this feature is (you can see it in our Shark NV752 review). In our opinion this is something you want if you have allergies or asthma and are buying a vacuum with HEPA filtration. HEPA filtration can be somewhat ineffective without it. This, of course, varies from vacuum to vacuum but in general we see longer warranties with Shark. Their uprights often have a 7 year limited manufacturer’s warranty while Dyson usually maxes out at 5 years. Even the Shark stick vacs (Rocket/IONFlex/SharkFLEX) have a 5 year warranty while the Dyson V6/V7/V8s have a 2 year warranty. Canister vacuums for both manufacturers have about the same length of warranty (5 years). Again, this metric depends on the vacuum, but in our experience Shark uprights are generally lighter than Dyson uprights. Dyson presently has 4 canister vacuums and Shark only makes 1, but again the Shark is lighter. The opposite is true when it comes to the stick vacuums. Dyson stick vacuums (V6/V7/V8) are lighter than Shark stick vacs (Rocket/IONFlex/SharkFLEX). This one is pretty cut and dried. 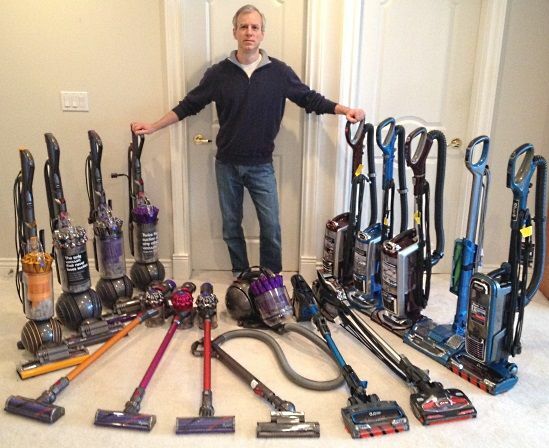 Dyson vacuums are on average more expensive than Shark vacuums. We’ve noise tested several Dyson uprights and several Shark uprights with a digital noise meter. The Sharks uprights are often quieter. However, with some of the stick vacuums we found the opposite. The Dyson V8 and Dyson V7, which have soundproofing, are quieter than the Shark Rocket HV382 and Shark IONFlex 2X IF252. The Dyson V6, which is the loudest of the Dyson stick vacuums, is similar in noise level to the Shark machines. This comes into play with the corded vacuums. Dyson usually has the edge here as their power cords are often as long or longer than those of their rival, and their hoses are frequently longer than those provided by Shark. Often available on Shark vacuums. Not available on Dyson vacuums. Suction and power is what many of the court cases have been about – and continue to be about. Shark claims that certain Shark models are more powerful than certain Dyson models. However Dyson contests this. Unfortunately for the consumer it is hard to measure the suction of these machines and put the claims to the test (we’ve tried and there are obstacles to getting it right). Also, while Dyson report the suction of their machines, Shark does not. In addition, even though Dyson provide suction specifications, they use units such as Air Watts which are not easily converted into other more commonly used units of suction. So it isn’t much help for comparison purposes – other than to compare one Dyson machine to another. These two popular upright vacuums are the companies' flagship machines. We have both of these vacuums and have used them extensively. They are quite different. The Dyson feels heavy, powerful and loud while the APEX is quieter and feels more manageable. We confess however that when we intend to do a thorough cleaning we usually pull out the Dyson. The brushroll is aggressive and does a great job on our low pile carpet and the extra cleaning reach of the hose is very useful. It is also possible - to some extent - that all that noise and power helps make you feel that it is doing a bang-up job. Nevertheless we like the results and it is often our go to machine for a thorough cleaning session. (1) Power cord length plus the hose as measured by Vacuum Cleaner Advisor. (2) Essentially measures the suction gap in the cleaner head. (3) Measured with a sound meter at a distance of 3 ft. On carpet with brushroll ON. This vacuum is hugely powerful but also a bit of a handful to wield. The weight of the vacuum makes it a little cumbersome despite the added maneuverabiity of “Ball Technology”. However the machine’s colossal suction ensures top notch cleaning of pet hair, bare floors, carpet, etc. and that's what you expect from a vacuum cleaner. There are some complaints though that the Ball Animal 2 can be difficult to move on deep pile carpet and that it can stick to some throw rugs. We have published a very detailed review of the Dyson Ball Animal 2 which includes testing, comparisons and several videos. This a a full size vacuum with HEPA filtration, an anti-allergen complete seal system, noise reduction technology, a lift-away canister, and Active-Glide Technology. Owners are mostly very pleased with this powerful, all-around, bagless upright vacuum. This is a versatile machine and it can clean bare floors and carpet, it can do overhead cleaning, and also portable vacuuming (using the lift-away feature). We also like the soft front brushroll when cleaning bare floors - it does have the ability to pull up stuck on dust. The full size APEX vacuums are not particularly lightweight however (for a Shark) and the short hose can be annoying. We have written a comprehensive review of the Shark APEX AX952 in which we cover almost every aspect of the vacuum. We also test the machine on carpet, bare floors and pet hair. The next two popular uprights are the more affordable Dyson Ball Multi Floor 2 and Shark Rotator Powered Lift Away TruePet NV752. These machines don’t have quite as many bells and whistles as the two flagship units above but they are still very popular with consumers. They are also capable vacuums and can be a great fit for some households. The Multi Floor has a much wider cleaner head than the Shark NV752 and you can feel this when you are vacuuming. The NV752 feels more compact and tight. It turns easier (despite the Dyson having Ball Technology) and is simply more graceful. The Dyson is also about 4 inches shorter to the top of the handle and that may make a difference to some people, depending on stature. If we use one of these two vacuums in the house it is usually the Shark NV752 – it’s one of our favorite machines. The Dyson Ball Multi Floor 2 has less suction than the Dyson Ball Animal 2 (the Multi Floor has 245 Air Watts while the Animal has 270 Air Watts), but the truth is it’s still a lot of suction and we couldn’t really tell the difference. The Multi Floor is lighter than the Animal and less costly - but the cleaning reach is less, the dust canister is smaller and you get one less tool. We do have to say that it is quite a striking machine. The combination yellow and gray with the gold cyclones is anything but ordinary. It's almost something of a conversation piece. The NV752 has been at the top of our list of best upright vacuums for 2 years now. It also appears in our article highlighting the top Shark Pet Vacuums. The NV752 does NOT have DuoClean Technology (2 brushrolls), and while we like this technology the NV752 still does a fine cleaning job without it. It also has the lift-away feature which is great (something you never see on a Dyson). It also comes with a host of good tools including a motorized pet tool which does a good job at pulling up pet hair. In addition, the vacuum has two LED headlights on the cleaner head as well as one built into the vacuum handle which helps when using the hose, handle and tools. Headlights are not critical but they are a nice touch, especially when you find yourself vacuuming in a dimly lit area. We have published a very detailed review of the Shark NV752 which includes testing and specifications. We also produced a lengthy video review of the NV752 which you can find at the bottom of the written review. The Dyson V8 Absolute and the Shark IONFLex 2X IF252 are the cream of the cordless crop for the two companies and they are very different machines. The V8 is quieter and lighter, but the IONFlex has a flexible wand, 2 batteries and costs less. Frankly we don't care much for the IONFlex flexible wand, and while the IONFlex does have more convenient controls, we still find the V8 more usable. It's the weight really. The V8 is super easy to handle and as a result is the most used vacuum in our household. (1) Essentially measures the suction gap in the cleaner head. (2) Measured with a sound meter at a distance of 3 ft. On carpet with brushroll ON. Low power mode. The IONFlex 2X IF252 is different from any other vacuum we have tested. It comes with 2 batteries, which is a great feature as one can be on charge while you are using the other in the vacuum. It also has a locking joint in the wand. This is an odd feature and it is good in some ways but not so great in others. It adds to the weight of the vacuum and isn’t that easy to use. On the other hand it does make for easy storage and it may help some people get under low furniture more easily. We found the similar Shark HV382 easier to work with, but then it is a corded vacuum. We have noticed that Shark states the IONFlex generates more suction power than the V8 - but this statement only refers to Low Power Mode and not MAX Mode. They also highlight that the IONFlex has a longer runtime that the V8 - but this is only when 2 batteries are used consecutively. These things are worthy of consideration when deliberating between the two vacuums. Check out our detailed Shark IONFlex review in which we have videos showing many of the vacuum’s features. We also compare run times in both low and high power modes between the Shark IONFlex and the Dyson V8. The V8, like most stick vacs, doesn’t do deep cleaning but it is very lightweight and so easy to use. Run time is good on the one battery and on MAX power mode the suction is top notch – although it doesn’t last long. The V8 also comes with two cleaner heads. A cleaner head for carpet and a special soft cleaner head for bare floors. The unit only has 1 battery however and a full recharge takes about 5 hours. Also, like many Dyson machines, this one is rather elegant. It is also small and easy to store. It even comes with a wall mount should you want to hang it out of the way. For more details you can read our Dyson V8 Absolute review. In addition, we recently reviewed the Dyson V7 Motorhead and in this review we compare the V7 to both the V6 and the V8. The comparison is very helpful for those who are trying to decide which Dyson cordless vacuum to buy. SO WHAT DO SHARK & DYSON OWNERS THINK? Determining which is the better vacuum - Dyson or Shark - depends a lot on what you want, what your requirements are, and your budget. However, there is another facet to this discussion – how do Shark and Dyson owners feel? 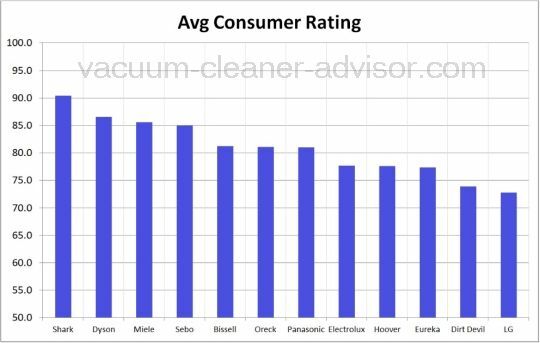 On Vacuum Cleaner Advisor we have been collecting consumer ratings and pricing data for vacuums for over 10 years, and we now have over 160,000 consumer ratings for hundreds of vacuum cleaners. We recently undertook a study to determine what this data may be telling us. 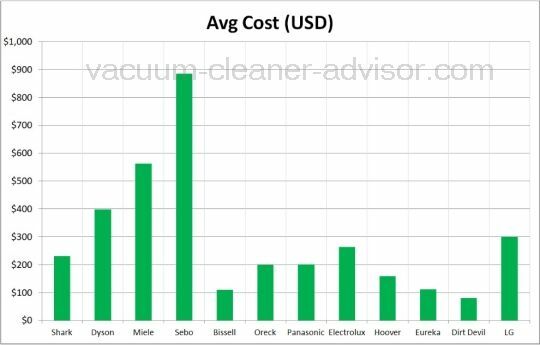 You can read the full article here - best vacuum brands - but the gist of it can be seen in the following two simple charts which show an interesting trend. Draw your own conclusions…. > What is the best rated vacuum cleaner? My husband is a Dyson guy and I recently purchased a Shark Rocket DuoClean HV381 from QVC. As you know, the three main components of these types of stick vacuums are the motor/canister, the vacuum head/roller housing, and the stick that connects the two. The front soft roller quit working on my Rocket at 5 months in. The mechanism, belt, bearings, whatever is located in the vacuum head, therefore, the entire thing needed replaced. Shark's 5yr warranty doesn't cover consumable parts like belts, filters, etc. (Seriously, the warranty says etc.) Unfortunately, the company considers the entire vacuum head to be a consumable part...ie, needing to be replaced frequently as a part of routine maintenance. A new one runs over $75. I didn't believe what I was hearing and called back a few times to see if I'd get a different answer. All I got was sympathy. So, I called QVC. Their customer service rep., upon hearing my story, said "What about their 5yr warranty!?" She promptly sent a return authorization, postage paid, and offered a full refund or replacement at no charge to me. Pretty sad when an authorized dealer offers better customer service and warranty coverage than the manufacturer. It's being returned today and I'm considering a Dyson. At least my husband is happy.